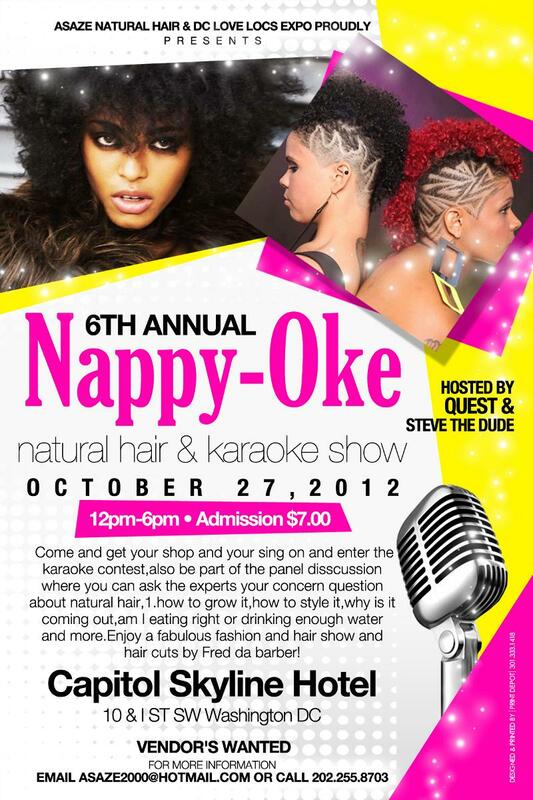 5 More Days Until the 6th Annual 2012 Nappy-Oke Event! Hurray! 5 More Days Left Until the 6th Annual Nappy-Oke Event!!!! Attendees of this year’s Nappy-Oke are definitely in for a treat 😮 Not only will everyone get to show off their karaoke skills throughout the day, but there will be tons of entertainment via wonderful local talent, that will include everything from spoken word artists to dance performances as well as spectacular hair and fashion shows. Attendees will also get to shop until they drop from various vendors featuring products for the entire family!!!! Thanks to the 2012 6th Annual Nappy-Oke Sponsors – there will be door prizes awarded throughout the entire event and attendees will receive goodie bags filled with wonderful products!